Some good websites exist for streaming Moroccan music. For Berber music, there's a great selection at https://www.izlanzik.org/. For Arab stuff, my previous go-to site was yala.fm, but lately the search function seems to be broken. More recently, I've been turning to http://www.ournia.co/, which has a large selection of Moroccan music (and other Arab/North African music). For some artists, one can find nearly comprehensive discographies. For others, especially those who have released albums on several different labels and over many years, the selection will be more spotty. Case in point: the late, great âita singer Fatna Bent Lhoucine (1935-2005). When I first visited Morocco, she was on TV all the time - a real household name. However, her vast recorded output seems to have been primarily on 45s and on a variety of local cassette labels, many of which remain unreleased in digital format. 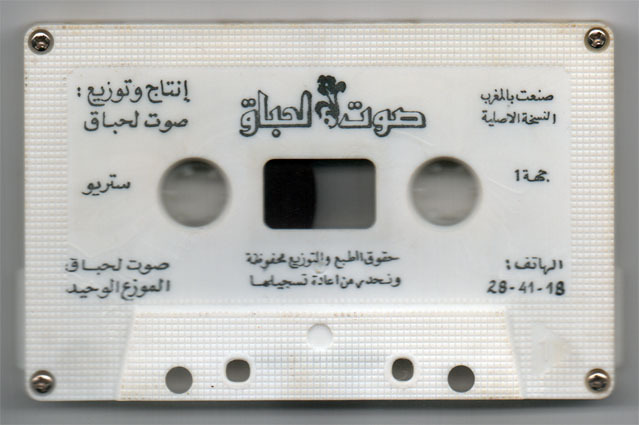 Ournia actually has a decent selection of recordings of Fatna Bent Lhoucine. Some of them appear to be reissues of vintage recordings, others are possibly recordings from late in her career. Even with album art available, it's often unclear whether the images are representative of the original album art (in the case of CD reissues of cassettes), or whether vintage photos accompany more recent recordings (or vice versa). Another great online source of Moroccan recordings, specifically of âita recordings, is Settatbladi.org, a non-commercial online digital collection started by âita aficionados in 2007. They recently migrated the entire collection to the Internet Archive. There's an ocean of material there (over 2000 songs). Whereas Ournia seems to feature material that has been commercially issued in digital format, Settatbladi's curators have digitized their private collections of 45s, LPs, cassettes, and CDs. It's not always possible to match audio files with corresponding cover art (which is housed in a separate archive), and I don't see information there about the dates of the recordings. Still, it's a remarkable collection, and well worth swimming its seas of sound! Naturally, they have plenty of recordings of Fatna Bent Lhoucine. Over here at Moroccan Tape Stash, I can't be very comprehensive about artist discographies - all I can do is offer copies of things that happened to fall into my hands over the years. Maybe mp3 downloads are going the way of the cassette tape and compact disc. Perhaps I should turn these into streaming versions, or put them all on YouTube to make them more accessible to all. 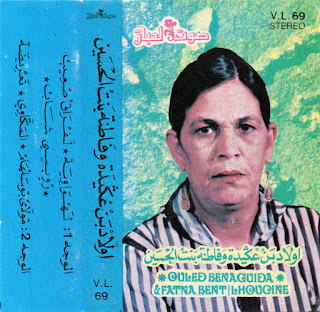 For now, though, we'll keep on with present format, and offer up a couple of tapes of Fatna Bent Lhoucine with her longtime collaborators the Ouled ben Aguida. These are on the label Sawt Lahbak. Neither are perfect in terms of audio, but the music on them is great. The tape for which I actually have a j-card (V.L. 69) lists 6 songs, but only 3 appear on the 40 minute cassette. The audio quality is a bit warbly. The other tape features 2 songs. (There were three tracks on the tape, but the third was just the beginning of the 1st song again.) The playback on the tape sounded way too slow (tempo) and low (pitch). I sped up the tempo/raised the pitch in Logic, and it sounds more natural now. The overall audio quality is better than on the 1st tape. More Fatna Bent Lhoucine in the Stash here.